The Moehog is a four-legged pet with droopy, floppy ears and a very short snout. They are also most notably known physically for their curved tusks. They have a very short tail that gets a bit straggly at the end, and a few colored stripes running horizontally along their back. 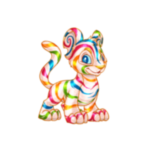 They are also one of the largest Neopets available, standing at roughly 95cm. On top of their head, they have a Mohawk-like pattern of hair. They have a body built for labor but a personality that prefers a more laid back, fun lifestyle. Originally, they come from a small mountainous area, near the outskirts of the Haunted Woods, a place that hasn't much been explored by those visiting Neopia. Due to this, we do not know much about their history or the geographic location they came from, but we do know that they used to be work animals for a society of Skeiths. Go figure, the super lazy Skeiths were using kindhearted Moehogs to get all their work done!! Eventually, they wanted a more extravagant life, to experience all the games available in greater Neopia, foods, other cultures and life outside of what they knew, so they forged a path out of the mountains and joined the general population. Originally, only a small number had made it out, causing the Neopet to be "limited edition" when it came to adoption, but over time more and more followed the path out and now they are readily available to be cared for by any willing Neopian. Moehogs naturally have an inclination to lead, they are a fairly independent species and know how to take control. It was this instinct that allowed them to so easily get out of the mountains and settle in a new area, and this instinct remains consistent and prevalent among all Moehogs to this day. Though, the most prominent example of this strength and leadership would have to be Judge Hog! Judge Hog is the leader of the Defenders Of Neopia, a superhero organization devoted to freeing the world from injustice. They are a group that goes toe to toe with the most dastardly villains, from Master Vex to Dr. Sloth himself. There is no foe they are afraid to take on, and this fearless group has become such a success all thanks to their Moehog leader! Judge Hog is not only the epitome of power, but he is also a perfect spokesperson for safety. He frequently pipes up with helpful messages and little warnings in an attempt to keep everyone as safe as possible. He knows the villains are the real enemy, but people make every day mistakes that put them in danger as well, and he works just as hard to teach young Neopians not to wander off down dark alleyways and other perilous environments all alone. He's also used his image to create an entire brand around the heroes, You can find a line of wearables, stamps, and even a Negg or two featuring the Defenders Of Neopia. There was a whole line of comics, a special release in the NC Mall, and an entire plot. He's an amazing businessman! Because of all his success protecting Neopia, I wanted to take some time to sit down with him and really learn more about him and what he does; about how his branding has helped the world become a safer place. So without further ado, here is Judge Hog! Judge Hog-Thank you so much for having me in today! I really appreciate your time. Interviewer-No, no, thank you! I'm sure you must have a sporadic and busy schedule, I don't even know how you found time for this! Judge Hog-Any time I can spread the word about safety, I'll do it. Keeping up an image is just as important as fighting villains face to face. Interviewer-That's quite admirable, sir! Can you elaborate further on that statement, keeping up an image? Judge Hog-Of course. Fighting against evil is tremendously important, that which directly takes out the evil. But every day new evils pop up, new villains are created. Expanding the Defenders Of Neopia brand was a decision to help inspire the masses. The image of us as heroes, the captivating costumes, the strength, the impact we create, and the dedication to our mission...that inspires people. It inspires people to be like us, it inspires people to be good. It inspires people in their every day lives to keep an eye out and to put a stop to questionable activities, even if it's as little of a matter as their classmate stealing a pencil and them politely asking the evil-doer to put it back. Interviewer-Well then, this whole thing is about way more than just taking down the bad guys! Judge Hog-Yes, it's about stopping evil before it can begin. It's about inspiring the kids to go the heroic route, that you can succeed without doing wrong or hurting others. That is why the press is so important, that is why the fashion line is out there. No one is going to wear the Aisheenas Collectors Wig and rob a bank. They are going to emulate the character they are dressed as, a good soul with good intentions. Interviewer-It's amazing how you've been able to expand this all so much and create such a firm hold in Neopia! I'm in awe of your ability to spread goodness and safety so well and inspire so many Neopets around Neopia. You very clearly work hard to maintain the positive message. Judge Hog-Thank you! We all work hard, it's not just me. I trust my team to handle things at the office while I'm out doing these very important press events. If we were to just engage in fighting at the Battledome and not tell anyone about it, we'd still be defeating evil but every day, new evil would emerge and we have to do what we can to not allow it to go on. It would be a never-ending battle. Luckily through these other outlets we are lowering the "evil rate" as I call it, and creating a more heroic, safe, and united society. We want everyone to know that no matter who you are, you can be a hero in some way, even if it's just for one person. It makes all the difference. Interviewer-Thank you so much for stopping by today, and thank you for all the work you do! Do you have any parting words for Neopians reading this who may not know how to be heroic in their every day life? Judge Hog-My best advice is to smile. A smile is contagious and kindness goes a long way. Choose happiness over negativity, if you have nothing nice to say...say nothing at all. What an inspirational figure! That wraps up our interview with such a noble guy. I think it's important if we all keep in mind what he had to say because it's true. There is goodness in all of us. Have a happy Moehog Day, Neopia!